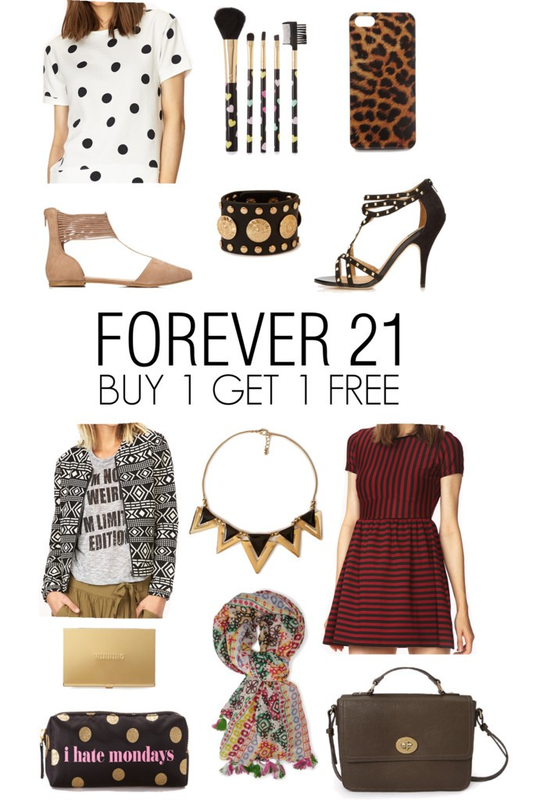 Most of you know that I am an avid Forever 21 shopper. Half of my closet is from there and I have zero shame admitting it. From shoes, bags, scarves, jewelry and clothes, you will most likely find me wearing at least one piece from Forever 21 every single day. It is not the easiest place to walk into and find something. Their online selection can be overwhelming at times, but I think I have figured my way around. I mean, I have been shopping there since, well, I won't say how many years. I got an email yesterday from my forever friends promoting that all sale items are buy one get one free. I knew I had to share it with all of you. They typically only run this deal a few times a year, so if you are looking to add some new pieces for spring, stock up on items for next fall/winter or buy some gifts for friends/family, I would hop over ASAP. At these crazy, amazing prices, the best of the best won't last long. Yes, their shoes are comfortable and durable 95% of the time. I typically get mediums in the Forever 21 brand and smalls in their contemporary line, Love 21. The rings turn my fingers colors if I don't take them off when I wash my hands. Items from Forever 21 actually last, again 95% of the time. The quality of their pieces have come a long way over the years. Their faux leather bags actually look and feel like real leather. I swear they should hire me for their promotions department. I work really well from home. Pretty satchel! You always find the cutest things at F21... they have so much inventory it can be really overwhelming, but they are definitely a great option for inexpensive trendier pieces. I wish they had a kid's line like H&M! There's nothing wrong with Forever 21! I love the make up brushes. I buy them for my daughter so she doesn't use mine! Love that stripped dress and the triangle necklace. Thanks for sharing! You can't g o wrong with Forever 21 that store is addictive. omg i just filled up a shopping cart and ditched it. I have spent so much lately but this sale is almost too good to be true! thanks for sharing lady! Love this store! I used to work there, so I like to think I know how to shop there well :) Thanks for the heads up on the sale! Love some Forever 21! Such an easy, affordable way to try out new trends! I've always been so nervous at the quality of their shoes, but I'm definitely going to give them a try the next time I come across a pair I love! Do you know if this is in store as well or just online?? I love Forever21! A lot of my favorite pieces have come from there! Affordable and trendy, whats not to love! This is so true, Forever 21 has seriously come a long way. Heading over to the site now, nothing better than a little buy 1 get 1 free! Oh crap. Now I need to go shop!!! My hubby will KILL me!!!! Forever21 surprises me often! Especially with trendy items, it's a great place to shop so you don't overspend on an item that may go out of style faster than it was in! Nice offer, we are going to see the web! I am always surprised at how much I get for my money at Forever 21! Love that place! Forever 21 this past winter and have been extremely happy with the quality and especially the prices. I love them too much....I really need to resist this sale but that may not be possible. and I'm off to shop!! thanks for the heads up! Thanks for the heads up! I'm totally going to have to check this out later! I hardly shop at F21 anymore because of how overwhelming the store and website are. (Maybe I'm just lazy haha) I can never go in there just to browse... I always go looking for something very specific! Those makeup brushes you featured are so cute! Haha...I hate to admit that a large portion of my stuff is from there also... It's what happens when you need everything and don't have a million dollars. Lol! Ok... I have never thought to buy shoes from there but you sold me! I love both pairs you have here! Hi-5'ing you...girl after my own heart! I have never had a problem with F21 stuff. Plus, if you wear/wash/dry something a few times, at least you got your money's worth! I mainly just try not to wash their stuff every time I wear it, and I almost never dry their stuff. It makes it last for years!